This article is about the Suburb of Sydney. For other uses, see Parramatta (disambiguation). Parramatta (/ˌpærəˈmætə/) is a prominent suburb of Sydney, in the state of New South Wales, Australia, 20 kilometres (12 mi) west of the Sydney central business district on the banks of the Parramatta River. Parramatta is the administrative seat of the City of Parramatta and is often regarded as the second Central Business district of Sydney. Parramatta, founded by the British in 1788, the same year as Sydney, is the oldest inland European settlement in Australia and the economic capital of Greater Western Sydney. Since 2000, government agencies such as the New South Wales Police Force and Sydney Water have relocated to Parramatta from the centre of Sydney. Established in 1799, the Old Government House is a world heritage site and museum within Parramatta Park and is Australia's oldest surviving public building. Parramatta is a major business and commercial centre, and home to Westfield Parramatta, the tenth largest shopping centre in Australia. Parramatta is also the major transport hub for Western Sydney, servicing trains and buses, as well as having a ferry wharf and future light rail and metro services. Major upgrades have occurred around Parramatta railway station with the creation of a new transport interchange, and the ongoing development of the Parramatta Square local government precinct. Radiocarbon dating suggests human activity occurred in Parramatta from around 30,000 years ago. The Darug people who lived in the area before European settlement regarded the area as rich in food from the river and forests. They called the area Baramada or Burramatta ('Parramatta') which means "head of waters", "the place where the eels lie down" or "eel waters". To this day many eels and other sea creatures are attracted to nutrients that are concentrated where the saltwater of Port Jackson meets the freshwater of the Parramatta River. The Parramatta Eels Rugby League club chose their symbol as a result of this phenomenon. Parramatta was founded in 1788, the same year as Sydney. As such, Parramatta is the second oldest city in Australia, being only 10 months younger than Sydney. The British Colonists, who had arrived in January 1788 on the First Fleet at Sydney Cove, had only enough food to support themselves for a short time and the soil around Sydney Cove proved too poor to grow the amount of food that 1,000 convicts, soldiers and administrators needed to survive. During 1788, Governor Arthur Phillip had reconnoitred several places before choosing Parramatta as the most likely place for a successful large farm. Parramatta was the furthest navigable point inland on the Parramatta River (i.e. furthest from the thin, sandy coastal soil) and also the point at which the river became freshwater and therefore useful for farming. On Sunday 2 November 1788, Governor Phillip took a detachment of marines along with a surveyor and, in boats, made his way upriver to a location that he called The Crescent, a defensible hill curved round a river bend, now in Parramatta Park. As a settlement developed, Governor Phillip gave it the name "Rose Hill" after British politician George Rose. On 4 June 1791 Phillip changed the name of the township to Parramatta, approximating the term used by the local Aboriginal people. A neighbouring suburb acquired the name "Rose Hill", which today is spelt "Rosehill". In an attempt to deal with the food crisis, Phillip in 1789 granted a convict named James Ruse the land of Experiment Farm at Parramatta on the condition that he develop a viable agriculture. There, Ruse became the first person to successfully grow grain in Australia. The Parramatta area was also the site of the pioneering of the Australian wool industry by John Macarthur's Elizabeth Farm in the 1790s. Philip Gidley King's account of his visit to Parramatta on 9 April 1790 is one of the earliest descriptions of the area. Walking four miles with Governor Phillip to Prospect, he saw undulating grassland interspersed with magnificent trees and a great number of kangaroos and emus. The Battle of Parramatta, a major battle of the Hawkesbury and Nepean Wars, occurred in March 1797 where resistance leader Pemulwuy led a group of Bidjigal warriors, estimated to be at least 100, in an attack on a government farm at Toongabbie, challenging the British Army to fight. Governor Arthur Phillip built a small house for himself on the hill of The Crescent. In 1799 this was replaced by a larger residence which, substantially improved by Governor Lachlan Macquarie from 1815 to 1818, has survived to the present day, making it the oldest surviving Government House anywhere in Australia. It was used as a retreat by Governors until the 1850s, with one Governor (Governor Brisbane) making it his principal home for a short period in the 1820s. In 1803, another famous incident occurred in Parramatta, involving a convicted criminal named Joseph Samuel, originally from England. Samuel was convicted of murder and sentenced to death by hanging, but the rope broke. In the second attempt, the noose slipped off his neck. In the third attempt, the new rope broke. Governor King was summoned and pardoned Samuel, as the incident appeared to him to be divine intervention. In 1814, Macquarie opened a school for Aboriginal children at Parramatta as part of a policy of improving relations between Aboriginal and European communities. This school was later relocated to "Black Town". Parramatta has a humid subtropical climate (Köppen climate classification: Cfa) with mild to cool winters and warm, sometimes hot summers, and rainfall spread throughout the year. Depending on the wind direction, summer weather may be humid or dry, though the humidity is mostly in the comfortable range, with the late summer/autumn period having a higher average humidity than late winter/early spring. Summer maximum temperatures are quite variable, often reaching above 35 °C (95 °F), on average 8.1 days in summer, and sometimes remaining in the low 20s, especially after a cold front or a sea breeze, such as the southerly buster. Northwesterlies can occasionally bring hot winds from the desert that can raise temperatures higher than 40 °C (104 °F) mostly from November to February. Parramatta is slightly warmer than Sydney CBD in the summer due to the urban heat island effect and its inland location. In extreme cases though, it can be 5–10 °C (9–18 °F) warmer than Sydney, especially when sea breezes do not penetrate inland on hot summer and spring days. For example, on 28 November 2009, the city reached 29.3 °C (84.7 °F), while Parramatta reached 39.0 °C (102.2 °F), almost 10 °C (18 °F) higher. Rainfall is fairly evenly divided between summer and winter, but is slightly higher during the first three months of the year, when easterly winds dominate. The second half of the year tends to be drier (late winter/spring), that is when westerly winds dominate, which bring drier conditions. Thunderstorms are common in the months from early spring to early autumn, occasionally quite severe thunderstorms can occur. Snow is virtually unknown, having been recorded only in 1836 and 1896 Parrammatta gets 106.6 days of clear skies annually. Church Street is home to many shops and restaurants. The northern end of Church Street, close to Lennox Bridge, features al fresco dining with a diverse range of cuisines. The southern end of Church Street features many Chinese restaurants and extends past Westfield to Auto Alley. Immediately south of the CBD Church Street is known across Sydney as 'Auto Alley' for the many car dealerships lining both sides of the street as far as the M4 Motorway. Since 2000, Parramatta has seen the consolidation of its role as a government centre, with the relocation of agencies such as the New South Wales Police Force Headquarters and the Sydney Water Corporation from Sydney CBD. At the same time, major construction work occurred around the railway station with the expansion of Westfield Shoppingtown and the creation of a new transport interchange. The western part of the Parramatta CBD is known as the Parramatta Justice Precinct and houses the corporate headquarters of the New South Wales Department of Attorney General and Justice. Other legal offices include the Children's Court of New South Wales and the Sydney West Trial Courts, Legal Aid Commission of New South Wales, Office of Trustee and Guardian (formerly the Office of the Protective Commissioner), NSW Registry of Births, Deaths and Marriages, Office of the Director of Public Prosecutions, as well as a branch of the Family Court. Nearby on Marsden Street is the Parramatta Courthouse and the Drug Court of New South Wales. The Garfield Barwick Commonwealth Law Courts Building (named in honor of Sir Garfield Barwick), houses courts of the Federal Magistrates Court and the Family Court of Australia. The NSW Government has also announced plans to secure up to 45,000m2 of new A-grade leased office space in Parramatta to relocate a further 4,000 workers from the Sydney CBD. The Parramatta skyline in 2010. The locality is the largest centre in Western Sydney. Parramatta Square (previously known as Civic Place) is a proposed civic precinct located in the heart of the city, adjacent to Parramatta Town Hall. The proposal includes a redevelopment of the Parramatta Civic Centre, a culture and arts centre and a new plaza. The designs of the first two projects, a 65-storey residential skyscraper and an office building were announced on 20 July 2012. Parramatta Square will also become home to 3,000 National Australia Bank employees to be relocated from the Sydney CBD by 2020. Centenary Square, formerly known as Centenary Plaza, was created in 1975 when the then Parramatta City Council closed a section of the main street to traffic to create a pedestrian plaza. It features an 1888 Centennial Memorial Fountain and adjoins the 1883 Parramatta Town Hall and St John's Cathedral. A hospital known as The Colonial Hospital was established in Parramatta in 1818. This then became Parramatta District Hospital. Jeffery House was built in the 1940s. With the construction of the nearby Westmead Hospital complex public hospital services in Parramatta were reduced but after refurbishment Jeffery House again provides clinical health services. Nearby, Brislington House has had a long history with health services. It is the oldest colonial building in Parramatta, dating to 1821. It became a doctors residence before being incorporated into the Parramatta Hospital in 1949. Church Street takes its name from St John's Cathedral (Anglican), which was built in 1803 and is the oldest church in Parramatta. While the present building is not the first on the site, the towers were built during the time of Governor Macquarie, and were based on those of the church at Reculver, England, at the suggestion of his wife, Elizabeth. The historic St John's Cemetery is located nearby on O'Connell Street. St Patrick's Cathedral (Roman Catholic) is one of the oldest Catholic churches in Australia. Construction commenced in 1836, but it wasn't officially complete until 1837. In 1854 a new church was commissioned, although the tower was not completed until 1880, with the spire following in 1883. It was built on the site to meet the needs of a growing congregation. It was destroyed by fire in 1996, with only the stone walls remaining. On 29 November 2003, the new St Patrick's Cathedral was dedicated. The historic St Patricks Cemetery is located in North Parramatta. The Uniting Church is represented by Leigh Memorial Church. Parramatta Salvation Army is one of the oldest active Salvation Army Corps in Australia. Parramatta is also home to the Parramatta and Districts Synagogue, which services the Jewish community of western Sydney. The Greek Orthodox Parish and Community of St Ioannis (St John The Frontrunner) Greek Orthodox Church was established in Parramatta in May 1960 under the ecumenical jurisdiction of the Greek Orthodox Archdiocese of Australia to serve the predominantly emigrating Greek population of Greater Western Sydney. Originally, the liturgies where held in the hall of St John's Ambulance Brigade in Harris Park until the completion of the church in December 1965 located in Hassall Street Parramatta. The parish now is at the corner of George and Purchase Streets. The Parish Community of St Ioannis continues to serve over 5,000 Greek parishioners. A Buddhist temple is located in Cowper Street, Parramatta. Parramatta's Mosque is in an apartment building on Marsden Street, Parrmatta. The district is served by BAPS Swaminarayan Hindu temple located on Eleanor St, Rosehill, and a Murugan Hindu temple in Mays Hill, off Great Western Highway. Parramatta Park is a large park adjacent to Western Sydney Stadium that is a popular venue for walking, jogging and bike riding. It was formerly the Governor's Domain, being land set aside for the Governor to supply his farming needs, until it was gazetted as a public park in 1858. As the Governor's Domain, the grounds were considerably larger than the current 85 hectare Parramatta Park, extending from Parramatta Road in the south as evident by a small gatehouse adjacent to Parramatta High School. For a time Parramatta Park housed a zoo until 1951 when the animals were transferred to Taronga Zoo. Parramatta is known as the 'River City' as the Parramatta River flows through the Parramatta CBD. Its foreshore features a playground, seating, picnic tables and pathways that are increasingly popular with residents, visitors and CBD workers. Prince Alfred Square is a Victorian era park located within the CBD on the northern side of the Parramatta River. It is one of the oldest public parks in New South Wales with trees dating from circa 1869. Prior to being a public park, it was the site of Parramatta's second gaol from 1804 until 1841 and the first female factory in Australia between 1804 and 1821. In contrast to the high level of Car dependency throughout Sydney, a greater proportion of Parramatta's workers travelled to work on public transport (45.2%) than by car (36.2%) in 2016. Parramatta railway station is a major transport interchange on the Sydney rail network. It is served by Sydney Trains' Cumberland Line, Inner West & Leppington Line and North Shore, Northern & Western Line. NSW TrainLink operate intercity services on the Blue Mountains Line as well as services to rural New South Wales. The station was originally opened in 1855, located in what is now Granville, and known as Parramatta Junction. The station was moved to its current location and opened on 4 July 1860, five years after the first railway line in Sydney was opened, running from Sydney to Parramatta Junction. The current station was upgraded, with work beginning in late 2003 and the new interchange opening on 19 February 2006. The original station still exists within the over-all structure as part of Platform 4. A free bus Route 900 is operated by Transdev NSW in conjunction with the state government. Route 900 circles Parramatta CBD. A free bus also links Parramatta Stadium to Parramatta railway station during major sporting events. The Parramatta ferry wharf is at the Charles Street Weir, which divides the tidal saltwater from the freshwater of the upper river, on the eastern boundary of the Central Business District. The wharf is the westernmost destination of Sydney Ferries' Parramatta River ferry services. The two-line Parramatta Light Rail project was announced in 2015. Lines originating from Carlingford and Olympic Park via Wentworth Point will form a combined route at Rydalmere or Camellia and pass through Parramatta before terminating at Westmead. Sydney Metro West is a proposed metro line between the Sydney central business district and Westmead. The line was announced in 2016 and would include a station at Parramatta. James Ruse Drive serves as a partial ring-road circling around the eastern part of Parramatta to join with the Cumberland Highway to the north west of the city. The main north-south route through Parramatta is Church Street. To the north it becomes Windsor Road, and to the south it becomes Woodville Road. About 24.3% of people were born in Australia. The next most common countries of birth were India 29.8%, China 12.0%, the Philippines 2.2%, South Korea 1.5% and Nepal 1.5%. However, only 6.5% identify their ancestry as Australian; the other common self-identified ancestries were Indian 26.9%, Chinese 16.3%, English 7.7% and Filipino 2.4%. About one quarter (23.5%) of people spoke English at home; other languages spoken at home included Mandarin 11.8%, Hindi 9.8%, Cantonese 4.5%, Tamil 4.4%, Gujarati 4.1% and Arabic 4.1%. This question is optional in the Census. Of the people who answered it, the most common response was Hinduism 28.5%; the next most common responses were "No Religion" 21.4%, Catholic 12.7%, Unstated 11.5% and Islam 6.2%. Parramatta has an over-representation of young adults when compared to the country as a whole. Parramatta residents' median age was 31 years, compared to the national median of 37. Children aged under 15 years made up 16.2% of the population (national average is 19.3%) and people aged 65 years and over made up 6.8% of the population (national average is 14.0%). The average weekly household income was $1,739, compared to the national average of $1,234. The majority of dwellings in Parramatta (81.6%) were flats, units or apartments; 10.2% were separate houses, and 6.7% were semi-detached (mostly townhouses). The average household size was 2.6 people. Parramatta is home to several primary and secondary schools. Arthur Phillip High School is the oldest public school in the district (it is in buildings which have been continuously used as a school since 1875), established in 1960 in its own right. Parramatta High School was the first coeducational school in the Sydney metropolitan area established in 1913. Our Lady of Mercy College is one of the oldest Catholic schools in Australia. Macarthur Girls High School is successor to an earlier school 'Parramatta Commercial and Household Arts School'. Others schools include Parramatta Public School, Parramatta East Public School, Parramatta West Public School, and St Patrick's Primary Parramatta. Several tertiary education facilities are also located within Parramatta. A University of New England study centre and two Western Sydney University campuses are situated in the suburb. The Western Sydney University Parramatta Campus consists of four sites: Parramatta South (the main site), Parramatta North (including the adjacent UWS Village, the Parramatta City campus located at 100 George Street and the Flagship Parramatta City Campus located at One Parramatta Square. Parramatta South campus occupies the site of the historic Female Orphan School.. Alphacrucis College is a national vocational and higher education college is also located in the suburb. The University of Sydney has also announced that it intends to establish a new campus in Parramatta. The Parramatta Advertiser is the local newspaper serving Parramatta and surrounding suburbs. Parramatta Park contains Old Government House and thus Parramatta was once the capital of the colony of New South Wales until Governors returned to residing in Sydney in 1846. Another feature is the natural amphitheatre located on one of the bends of the river, named by Governor Philip as "the Crescent", which is used to stage concerts. It is home to the Dairy Cottage, built from 1798 to 1805, originally a single-room cottage and is one of the earliest surviving cottages in Australia. The remains of Governor Brisbane's private astronomical observatory, constructed in 1822, are visible. Astronomers who worked at the observatory, discovering thousands of new stars and deep sky objects, include James Dunlop and Carl Rümker. In 1822, the architect S. L. Harris designed the Bath House for Governor Brisbane and built it in 1823. Water was pumped to the building through lead pipes from the river. In 1886, it was converted into a pavilion. Parramatta Stadium was home to local sporting teams until it was demolished in 2017. The Rosehill Race Course holds various race meets throughout the year, including: Derby Day, Golden Rose Day, and Rosehill Gardens Race Day. The Parramatta Farmers Markets occurs every Friday, and has local produce. Parramatta is the home of several professional sports teams. These teams include the Parramatta Eels of the National Rugby League and Western Sydney Wanderers of the A-League. Both teams formerly played matches at Parramatta Stadium that has since been demolished, and is currently being replaced with the 30,000-seat Western Sydney Stadium. Parramatta Stadium was also home to the now dissolved Sydney Wave of the former Australian Baseball League and Parramatta Power of the former National Soccer League. The newly built Bankwest Stadium opened its gates for the community on April 14, 2019 with free entry for all fans. Located on O’Connell Street, the stadium is in proximity of the Parramatta CBD. The opening sporting event will be the Round 6 NRL clash between Western Sydney rivals the Parramatta Eels and Wests Tigers on Easter Monday 22 April. It is being predicted that the new stadium will boost Western Sydney economy by contributing millions of dollars to it. ^ a b Australian Bureau of Statistics (27 June 2017). "Parramatta (State Suburb)". 2016 Census QuickStats. Retrieved 27 June 2016. ^ a b c d "Parramatta (suburb)". Geographical Names Register (GNR) of NSW. Geographical Names Board of New South Wales. Retrieved 2 October 2008. ^ "Parramatta". New South Wales Electoral Commission. 24 March 2007. Retrieved 2 October 2008. ^ "Baulkham Hills". New South Wales Electoral Commission. 24 March 2007. Retrieved 2 October 2008. ^ "Granville". New South Wales Electoral Commission. 24 March 2007. Retrieved 2 October 2008. ^ "Parramatta". Australian Electoral Commission. 19 October 2007. Archived from the original on 26 February 2009. Retrieved 2 October 2008. ^ "What's Next for Sydney's Second CBD". Retrieved 1 February 2018. ^ "Visitor Strategy for Parramatta 2011–2016" (PDF). City of Parramatta. ^ "Westfield Parramatta". Westfield Group. 2017. Retrieved 18 December 2017. ^ "Welcome to Parramatta NSW Australia". cityofparramatta.com. Retrieved 13 July 2014. ^ "Parramatta - New South Wales, Australia". ^ Troy, Jakelin. "The Sydney Language". Macquarie Aboriginal Words. Sydney: Macquarie Library. p. 76. ^ E. R. Pretyman (7 July 1970). "SOME NOTES ON THE LIFE AND TIMES OF CAPTAIN JAMES KELLY" (PDF). Retrieved 15 March 2018. ^ Dale, David (16 February 2008). "WHO WE ARE: The man who nearly changed everything". "The Sun Herald". ^ ""HERALD" SATURDAY MAGAZINE". The Sydney Morning Herald. National Library of Australia. 26 September 1953. p. 7. Retrieved 30 June 2014. ^ Norman, Heidi (2015). "Parramatta and Black Town Native Institutions". Dictionary of Sydney. Dictionary of Sydney Trust. Retrieved 8 February 2016. ^ "Warders Cottages". New South Wales State Heritage Register. Office of Environment and Heritage. H00709. Retrieved 18 May 2018. ^ "Lennox House". New South Wales State Heritage Register. Office of Environment and Heritage. H00751. Retrieved 18 May 2018. ^ "St. John's Anglican Cathedral". New South Wales State Heritage Register. Office of Environment and Heritage. H01805. Retrieved 18 May 2018. ^ "Lennox Bridge". New South Wales State Heritage Register. Office of Environment and Heritage. H00750. Retrieved 18 May 2018. ^ "Prince Alfred Square and potential archaeological site". New South Wales State Heritage Register. Office of Environment and Heritage. H01997. Retrieved 18 May 2018. ^ "Oddfellows Arms Inn". New South Wales State Heritage Register. Office of Environment and Heritage. H00276. Retrieved 18 May 2018. ^ "Norma Parker Correctional Centre". New South Wales State Heritage Register. Office of Environment and Heritage. H00811. Retrieved 18 May 2018. ^ "Cumberland District Hospital Group". New South Wales State Heritage Register. Office of Environment and Heritage. H00820. Retrieved 18 May 2018. ^ "Parramatta District Hospital - Brislington and Landscape". New South Wales State Heritage Register. Office of Environment and Heritage. H00059. Retrieved 18 May 2018. ^ "Roxy Theatre". New South Wales State Heritage Register. Office of Environment and Heritage. H00711. Retrieved 18 May 2018. ^ "Perth House and Stables". New South Wales State Heritage Register. Office of Environment and Heritage. H00155. Retrieved 18 May 2018. ^ "Shop and office". New South Wales State Heritage Register. Office of Environment and Heritage. H00278. Retrieved 18 May 2018. ^ "Harrisford". New South Wales State Heritage Register. Office of Environment and Heritage. H00248. Retrieved 18 May 2018. ^ "Parramatta Railway Station". New South Wales State Heritage Register. Office of Environment and Heritage. H00696. Retrieved 18 May 2018. ^ "Redcoats Mess House". New South Wales State Heritage Register. Office of Environment and Heritage. H00218. Retrieved 18 May 2018. ^ "1st/15th Royal NSW Lancers Memorial Museum Collection". New South Wales State Heritage Register. Office of Environment and Heritage. H01824. Retrieved 18 May 2018. ^ "Murphys House". New South Wales State Heritage Register. Office of Environment and Heritage. H00238. Retrieved 18 May 2018. ^ "Parramatta District Hospital - Archaeology". New South Wales State Heritage Register. Office of Environment and Heritage. H00828. Retrieved 18 May 2018. ^ "Macarthur House". New South Wales State Heritage Register. Office of Environment and Heritage. H00050. Retrieved 18 May 2018. ^ "Marsden Rehabilitation Centre Group". New South Wales State Heritage Register. Office of Environment and Heritage. H00826. Retrieved 18 May 2018. ^ "Parramatta Park and Old Government House". New South Wales State Heritage Register. Office of Environment and Heritage. H00596. Retrieved 18 May 2018. ^ "St. John's Anglican Cemetery". New South Wales State Heritage Register. Office of Environment and Heritage. H00049. Retrieved 18 May 2018. ^ "Travellers Rest Inn Group". New South Wales State Heritage Register. Office of Environment and Heritage. H00748. Retrieved 18 May 2018. ^ "Avondale". New South Wales State Heritage Register. Office of Environment and Heritage. H00239. Retrieved 18 May 2018. ^ "Roseneath Cottage". New South Wales State Heritage Register. Office of Environment and Heritage. H00042. Retrieved 18 May 2018. ^ "Parramatta Correctional Centre". New South Wales State Heritage Register. Office of Environment and Heritage. H00812. Retrieved 18 May 2018. ^ "Endrim". New South Wales State Heritage Register. Office of Environment and Heritage. H00379. Retrieved 18 May 2018. ^ "Broughton House". New South Wales State Heritage Register. Office of Environment and Heritage. H01302. Retrieved 18 May 2018. ^ "Daily Maximum Temperature - 066062". www.bom.gov.au. Bureau of Meteorology. Retrieved 2016-02-03. ^ "Daily Maximum Temperature - 066124". www.bom.gov.au. Bureau of Meteorology. Retrieved 2016-02-03. ^ "The climate of Sydney, Australia". www-das.uwyo.edu. ^ "Climate statistics: PARRAMATTA NORTH (MASONS DRIVE)". Bureau of Meteorology. Retrieved 3 February 2016. ^ "Auto Alley". Discover Parramatta. ^ "Government to expand Parramatta office footprint". Department of Finance, Services and Innovation. NSW Government. Retrieved 9 November 2018. ^ "Parramatta's urban renewal relaunched". Parramatta Sun. 20 July 2012. Retrieved 27 July 2012. ^ "NAB moves 3000 bankers into Parramatta Square". Daily Telegraph. Retrieved 9 November 2018. ^ "About Centenary Square". Parramatta Heritage Centre. City of Parramatta Council. Retrieved 9 November 2018. ^ "Jeffery House". Archived from the original on 26 September 2011. ^ "St John's Anglican Cathedral". Heritage Branch. Archived from the original on 2011-06-09. Retrieved 15 July 2010. See also Reculver. ^ "St Johns Cemetery". Discover Parramatta. 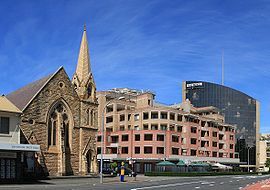 ^ "St Patrick's Catholic Cathedral: Parramatta". ohta.org.au. Retrieved 13 July 2014. ^ "History". St Patrick's Cathedral Parish Parramatta. Archived from the original on 31 January 2008. Retrieved 11 January 2008. ^ "Leigh Memorial Church". Parramatta Mission. Retrieved 18 December 2017. ^ "Parramatta Synagogue". Parramatta Synagogue. Retrieved 18 December 2017. ^ "Contact Us". Greek Orthodox Parish & Community of "St Ioannis" Parramatta. ^ "Home". Greek Orthodox Parish & Community of "St Ioannis" Parramatta. ^ "Nan Tien Temple, Australia". Nan Tien Temple. ^ "-- B A P S Swaminarayan Sanstha --". www.swaminarayan.org. ^ User, Super. "Home - Sydney Murugan Temple". www.sydneymurugan.org.au. ^ "Celebrating 160 Years". Parramatta Park. Retrieved 9 November 2018. ^ "Wild things: The history of Parramatta Zoo". 23 October 2017. ^ "Central River City vision". Greater Sydney Commission. Retrieved 9 November 2018. ^ "City River Foreshore". City of Parramatta Council. Retrieved 9 November 2018. ^ Australian Bureau of Statistics (27 June 2017). "Parramatta (State Suburb)". 2016 Census QuickStats. Retrieved 25 October 2018. ^ "Station Details – Parramatta". Transport for NSW. Retrieved 31 May 2018. ^ Bozier, Rolfe. "New South Wales Railways:Parramatta Railway Station". Retrieved 30 January 2008. ^ "Parramatta Transport Interchange – opening 19 February". CityRail. 14 February 2006. Archived from the original on 20 December 2007. Retrieved 30 January 2008. ^ "Transdev NSW route 900" (PDF). Transdev NSW. Retrieved 8 June 2015. ^ Transport for NSW (2017). "Parramatta River – Route Details". Retrieved 18 December 2017. ^ "Parramatta Light Rail - How the preferred network was chosen". Transport for NSW. Archived from the original on 10 December 2015. Retrieved 8 December 2015. ^ Constance, Andrew. "We're planning light rail extension to Sydney Olympic Park to improve public transport for 1000's[sic] of event goers". Twitter. Retrieved 19 October 2017. ^ "Sydney Metro West: a new railway, more trains for Western Sydney". Transport for NSW. 14 November 2016. ^ "Welcome to the Female Orphan School". uws.edu.au. Retrieved 13 July 2014. ^ "Parramatta-Westmead campus proposal takes shape". University of Sydney. Retrieved 24 January 2019. ^ "Parramatta Events - About". Discover Parramatta. ^ "About Parramasala Festival". Parramasala. Retrieved 31 August 2015. ^ "Old Government House". www.oldgovernmenthouse.com.au. ^ NSW, Infrastructure. "Infrastructure NSW : Western Sydney Stadium". Infrastructure NSW. Retrieved 2018-10-25. ^ "Sydney Business Chamber: Bankwest Stadium kicks goals for Western Sydney economy". Bankwest Stadium.